Pope John Paul II has been rushed to hospital in Rome suffering from breathing difficulties brought on by flu, the Vatican has confirmed. It said in a statement, the 84-year-old Polish-born pontiff was suffering from an acute respiratory infection. He was admitted to the Gemelli hospital as a precaution and is not in intensive care, the Vatican said. The Pope, last seen in public on Sunday, also suffers from Parkinson's disease and painful joint conditions. He was forced to cancel all engagements for several days after coming down with flu on Sunday, although he made his regular midday appearance at his window overlooking St Peter's Square. He has been running a high temperature since then, a Vatican source told the BBC's David Willey in Rome. The Pope will miss his weekly audience on Wednesday for the first time since September 2003, when he had an intestinal ailment. The Pope was taken by ambulance to the Gemelli hospital at about 2300 (2200 GMT) on Tuesday. "The flu which has been affecting the Holy Father for three days was complicated with acute inflammation of the larynx and laryngo-spasm," Vatican spokesman Joaquin Navarro-Valls said in statement. The Vatican said it would give a further update on the Pope's health sometime after 0900 (0800 GMT). Laryngo-spasm is a closure of the larynx that blocks the passage of air to the lungs - a condition where one cannot catch one's breath. The Pope is being cared for in the same room at the hospital where he has been treated several times before. It is the same hospital where he recovered from an attempt on his life in 1981, when he was shot in the abdomen. Vatican sources say a contingency plan was made for the Pope to be taken to hospital if he fell victim to the current flu epidemic sweeping Italy. A set of rooms is always reserved for him on the 10th floor. The appointment of Karol Wojtyla as the first Polish Pope in 1978 was in many ways seen as a groundbreaking move for the Roman Catholic Church. The first non-Italian Pope in 455 years - and at 58, the youngest Pope of the 20th Century - he was little known outside Vatican circles, and few experts tipped him as successor to Pope John Paul, who died after only 33 days in office. 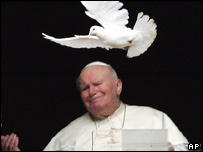 John Paul II is now in the 27th year of his pontificate which makes him almost the longest-reigning Pope in history. A 19th Century Pope occupied St Peter's throne for more than 30 years and no-one knows exactly how long the first Pope, St Peter, lived. John Paul II - the leader of the world's estimated one billion Catholics - has visited more than 100 countries, and is estimated to have effectively circled the globe 27 times.